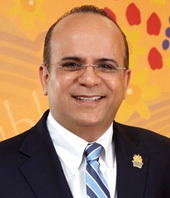 Tariq Farid is founder, President and Chief Executive Officer of Edible Arrangements International (“EAI”), the industry leader in providing high quality, artistically designed fresh fruit arrangements. Tariq is responsible for setting the company’s strategic direction and for the licensing of new franchises across the United States and internationally. Tariq launched the first Edible Arrangements® store in 1999 in East Haven, Connecticut. He was inspired by the convergence of three trends: Americans' growing consumption of fresh fruit, the robust growth in the specialty food market and the increasing amount of money Americans were spending on gifts. Edible Arrangements® was named one of America’s fastest-growing privately held businesses in America by Inc. Magazine and has been ranked first in its category by Entrepreneur Magazine’s Annual “Franchise 500” Ranking for the past seven consecutive years. In 2011 Edible Arrangements was ranked 9th on Forbes.com ‘Top Franchises for the Money” listing. Edible Arrangements has U.S. patents for proprietary fruit-cutting equipment that Tariq and his brother, Kamran Farid (COO) designed.